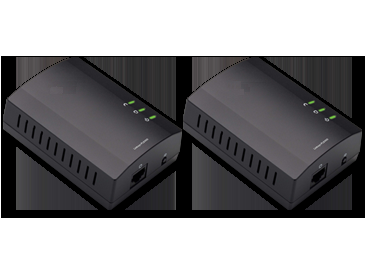 The PLEK400 is a Powerline 1-port Kit that consists of two (2) PLE400 devices. The PLE400 is a Powerline 1-port Fast Ethernet adapter that has one (1) Ethernet port. One of these devices is typically used in a powerline network to connect your network’s router to the household wiring. You can also use one of these in any room to connect one (1) wired Ethernet device to your powerline network.